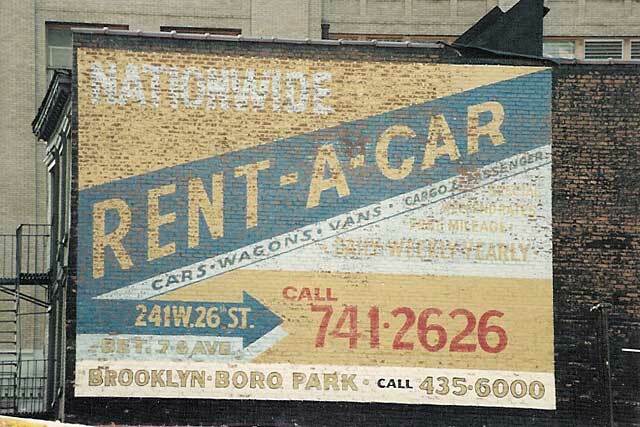 Nationwide established its car rental office at 241 W. 26th St. around 1980. In August 1988 I was in the neighborhood when this building was being torn down. Click here for image of workmen demolishing the sign. Even though the sign was destroyed, Nationwide supposedly continues (as of May 2003) to maintain a car rental agency in the garage at 241 W. 26th (but don't call 741-2626; the number has been changed to 741-9557).